I just got off the phone with the New Mexico Department of Ag. They will be sending me a bee researcher tomorrow to take a sample of my dying bees. It started about a week ago and it is still going on day by day. Very distressing to watch. 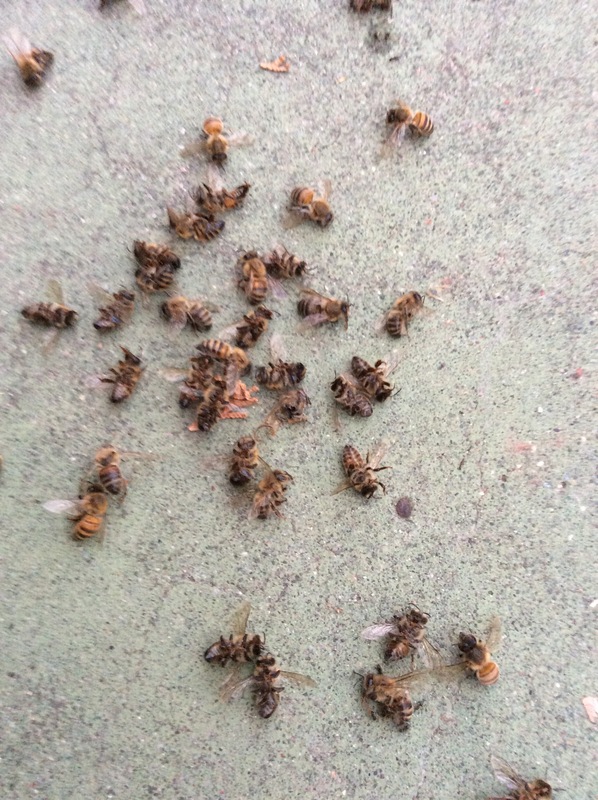 Piles of them outside the hive, falling and twitching or doing head spins, their nervous systems shutting down before they died on the hot cement. I cannot say for certain if it is a neonic0tinoid poisoning. Imidacloprid is the strongest suspect—the most prevalent neonicotinoid ingredient in over the counter bug sprays for backyard enthusiasts these days. It comes packaged by Bayer, Syngenta, DowCorning. This is a bug neurotoxin, destroying the nervous system of any insect. It has been shown to cause memory, orientation and nervous system problems, as well as reproductive decline. Dr. James Nieh, professor of biology at U.C. San Diego has studied the effects on humans. Parkinsonian symptoms and dementia. It’s all cumulative in our ecosystem. I hope our Bee City USA resolution at Albuquerque’s City Council meeting on August 15, 5pm will only draw more attention to the plight of honeybees and all insects and mammals impacted by this deadly class of insecticides. All of us as a human family need to begin to examine the things we do to the earth we live upon. I just read today that pesticides have increased over 30% in the last 50 years according to David Pimental, Biologist at Harvard U. Today we are looking at 3.5 pounds of pesticides per person. Likely it’s disproportionately distributed in poorer neighborhoods. But we all breathe the same air and eat the food that’s grown in the soil, with the same water. I encourage any of you to come to the City Council Chambers downtown at the Civic Plaza City Hall, basement floor, 5pm August 15 to raise your voices in support of bees! WEAR A WHITE SHIRT or your white beekeeping suit if you are a Beekeeper. This will make the bee supporters in the room very noticeable. I say stand up and be heard at events like this and also vote with your pocket book. If we don’t consume, and I mean EVER, the products that are grown/produced using these pesticides then there won’t be a commercial market. If we don’t use them in our backyards then there is no secondary market. No market, no product. Educate, speak out and be heard, or be the herd. Good on you dear Anita for speaking up and raising awareness! Thank you Darren! I know I stand on the shoulders of beekeepers like yourself, who have done so much for the bees and the bee community. I learned so much from you even in the short time I worked with you and your family observing cutouts. You’re awesome! Thanks for the good word and your support. It means alot! Anita, I’m so very sorry to hear about your bees! I remember when I opened one of my hives the 1st spring after I got them and there were 3 inches of dead bees in it. I felt like someone had kicked me in the stomach. My heart goes out to you!!!! So sorry I’ve been MIA – our travel schedule has been insanely hectic. I know I missed the deadline, but finally contributed to your swarmfunding – glad it has brought in some resources for all you do! I will be at City Council wearing white and bee attire – anything else I can do at this point????? Take care, see you on the 15th! I do remember you talking about your bee kill Pamela. Being “kicked in the stomach” is a good description. I feel helpless to do anything as they suffer. I will be awaiting the lab report about what went wrong. Thank you so, so much for your very generous contribution! You’ve been awesome in getting this job done, with your connections, professional skills of public speaking, and big heart for the bees! I can’t thank YOU enough! At this point it is just the ride to the finish line. We’ve done due diligence and I’m pretty sure it’s going to pass…! See you in your whites on Aug. 15!